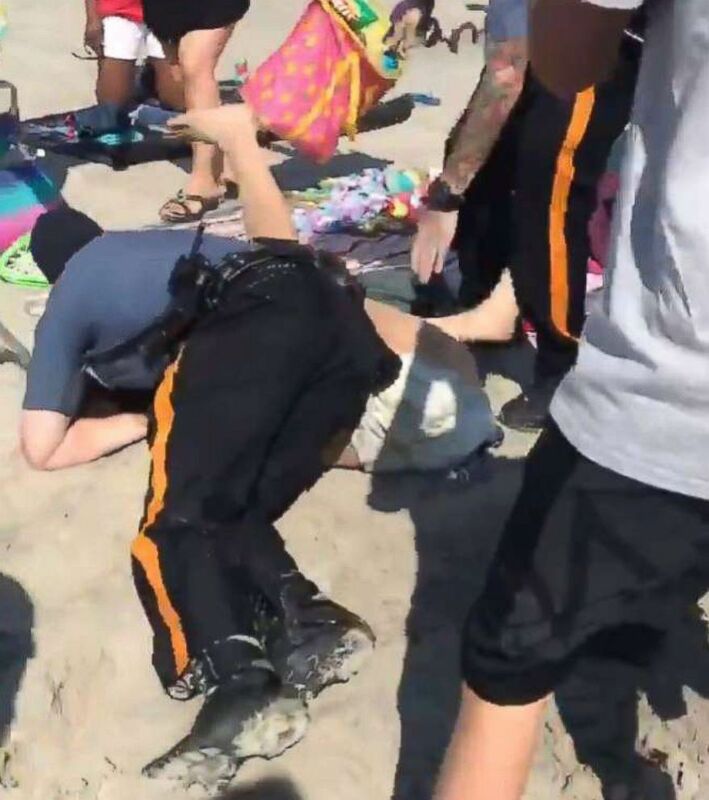 Two New Jersey police officers have been placed on administrative duty after one was recorded repeatedly punching a Philadelphia woman as they wrestled on the ground at a New Jersey beach over the Memorial Day weekend. Video of the confrontation, which took place in Wildwood, New Jersey, on Saturday around 4 p.m., has been viewed over 2 million times on Twitter. 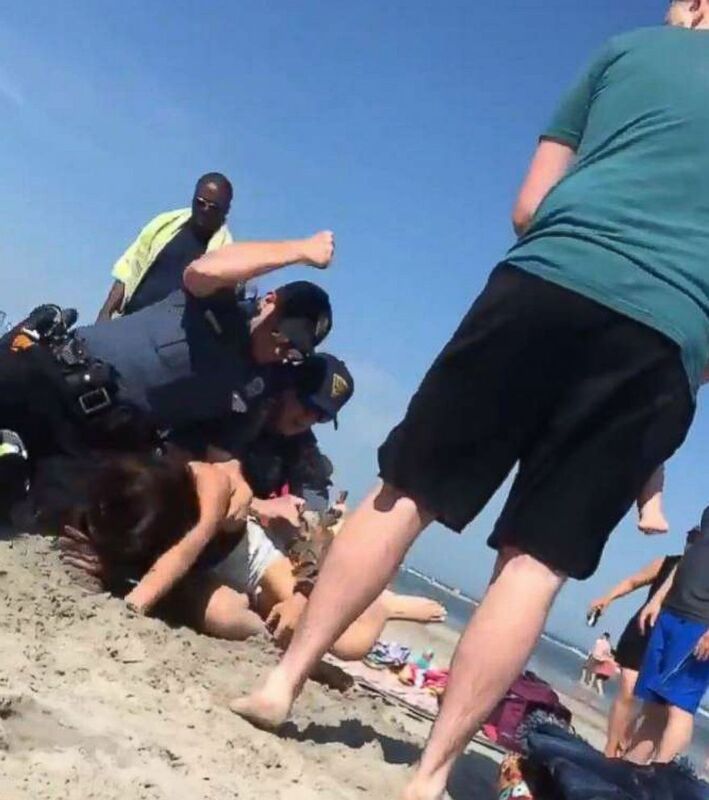 The footage shows multiple Wildwood Police Department officers working in concert to subdue a woman they identified as Emily Weinman, a 20-year-old from Philadelphia, who is seen flailing her arms and legs in a one-piece black swimsuit. The cops manage to wrestle Weinman to the sand and one is seen throwing three punches with his right fist down onto her head, while another pins her legs. Numerous beachgoers circling the melee can be heard repeatedly warning Weinman, "Stop resisting." Wildwood Police Chief Robert Regalbuto confirmed to ABC Philadelphia station WPVI that two officers had restricted to administrative duty but asked the public to not rush to any judgments before the body camera footage is released in its entirety in the coming days. "I clearly think it's something we need to work on, but, again, you have to see the entire video," the police chief said. When asked by a reporter if the incident will lead to more training, Regalbuto said "you can never have enough training," adding that the department will need to learn from its mistakes. Regalbuto also described his police officers as "the best" because of the high level of calls for service they answer. Weinman faces charges of aggravated assault on a police officer, aggravated assault by spitting bodily fluids at/on a police officer, disorderly conduct, resisting arrest, obstruction, and possession of alcohol by a minor. Alexis Hewitt was sleeping on a towel next to Weinman when she heard the commotion and woke up. She confirmed to ABC News that she shot video of the altercation. After Hewitt's video went viral the Wildwood Police Department put out a release that an internal investigation was opened and the officers involved in the arrest of Weinman "have been reassigned to administrative duty" pending its outcome. "Chief [Robert] Regalbuto stated that while he finds this video to be alarming, he does not want to rush to any judgment until having the final results of the investigation," the statement said.